For record keeping purposes it is useful if each hoist is marked with an identification number or tag and its working load limit information. When you have a hoist application which consists of a repetitive motion, it is especially important to be vigilant when inspecting your load chain. Information about the chain length and other characteristics and an inspection schedule should be recorded. 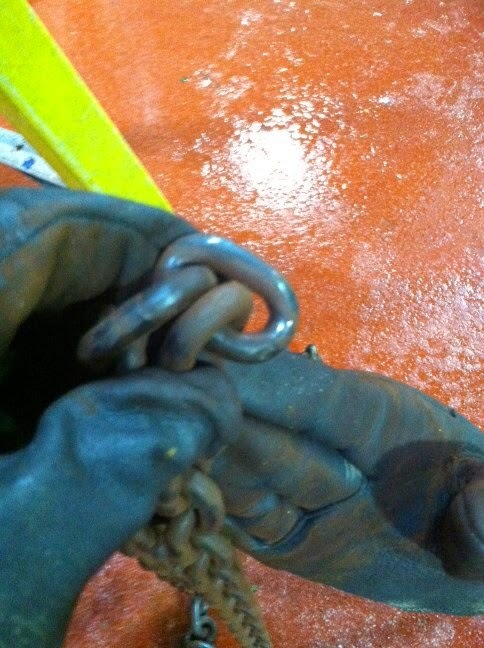 It is important both to inspect chain regularly and to keep a record of all chain inspections. Follow this guide for such an inspection system. 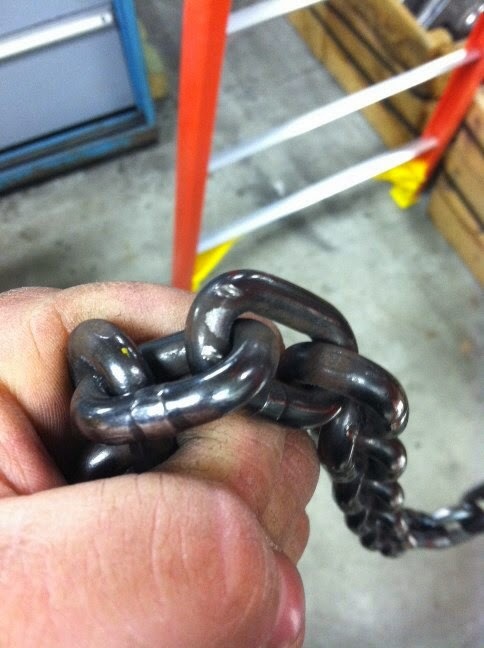 1) Make sure to clean load chain before inspecting. Cleaning with a non-acid/non-caustic solvent will make marks, nicks, wear and other defects visible. 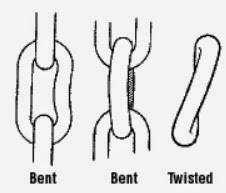 3) When inspecting your chains high friction areas it is extremely important to inspect the inner curve of the chain by rotating it around the link its connected to, otherwise you may miss friction and wear in the area most likely to be affected. High friction areas include areas where the chain touches the lower block and where the chain enters the hoist and collides with the pocket wheel or sheave. For a proper inspection of your links within your area of high friction you should take the link in question and rotate around the entirety of the links it is connected to so you can see the entire surface area of the link in question. The following images show examples of 2 proper chain-link inspections and the third image shows an insufficient inspection because the technician is only examining what is visible when the hoist is at a stand still. 4) Finally, Mark plainly with paint each link or attachment showing any of the conditions listed here to indicate rejection; remove from service until properly repaired.